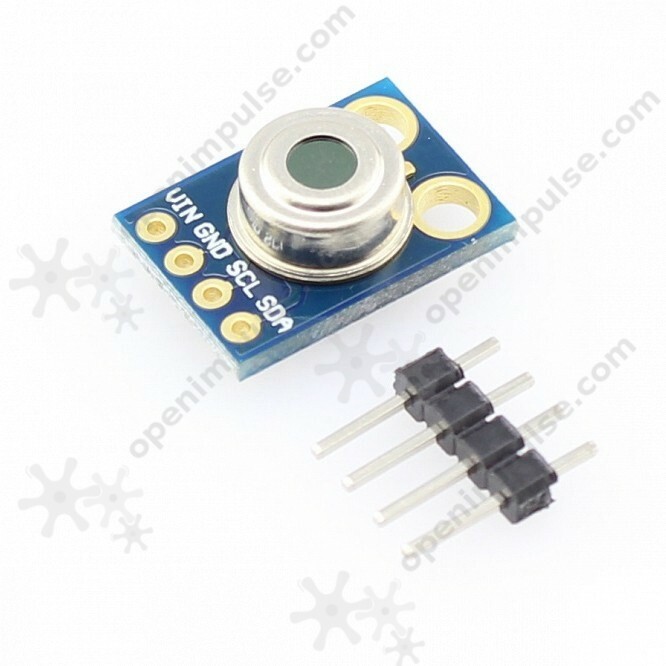 Temperature sensor module that can measure infrared temperature without touching the subject. This sensor is ideal for measuring the temperature of objects without getting in touch with them. You also have a medical precision sensor with a resolution of only 0.02 o C.
This sensor communicates through protocol I 2 C, so you can communicate with up to 127 sensors by different addressing. For calculating the operating distance and for more details about the I 2 C address , see the attached datasheet. It communicates on the I 2 C interface at a maximum frequency of 100 kHz. 2. Install the library and load the code on the development board. The library with which you can use this sensor is developed by AdaFruit. This is attached at the bottom of the page. To install it, you need to open Arduino IDE and select SKETCH> INCLUDE LIBRARY> ADD .ZIP LIBRARY. Now a window will open where you need to select the downloaded library. The library also includes an example. To access it, you must select FILE> EXAMPLES> ADD MXL90614 LIBRARY> mlxtest. Load the code on the development board and open the Serial Monitor and set BAUD RATE to 9600.